Study for a qualification in ITIL Service Operation (SO) by taking an online training course from 4PA! The purpose of this course is to help you gain detailed knowledge on industry practices in service management as documented in the ITIL Service Operation publication. Operations run the service as business as usual, ensuring that the agreed customer and business requirements are fulfilled. This course will provide you with a good understanding of the Service Operation principles, its processes and other aspects of this crucial lifecycle stage. Why Study ITIL SO with 4PA? This e-learning course contains all the learning materials you need in order to prepare for the ITIL Service Design exam. Our course has been accredited by PeopleCert, who are licensed by AXELOS as an Examination Institute for the ITIL® Service Operation Certificate in IT Service Management. In addition to the resources provided, the examination guidance recommends that candidates should complete at least 23 hours of personal study. Thinking of sitting the ITIL Service Operation Exam? On this page, you will find everything you need to know! In order to achieve this ITIL Intermediate qualification, you must pass the ITIL® Service Operation Certificate in IT Service Management exam. The course materials provided in the Service Operation eLearning course will provide you with all the information you need for this exam. 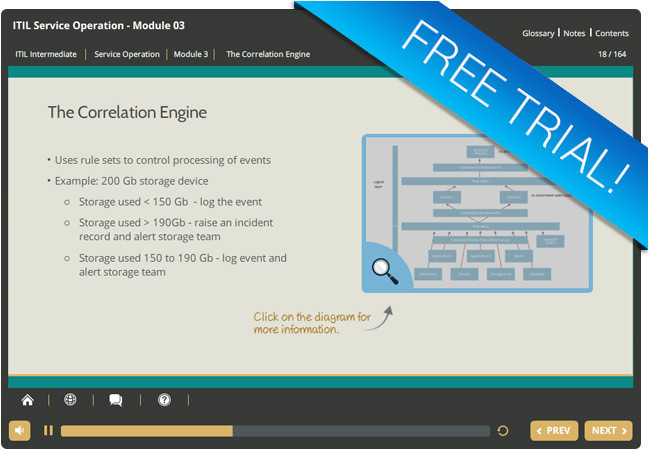 Why not try out a free trial module from our ITIL Service Operation eLearning course! In this ITIL Intermediate trial module, you will learn about the purpose objectives and scope of Service Operation and its value to the business. You will also learn the Service Operations fundamentals and the context of Service Operation in relation to the other service lifecycle stages of service strategy, service design, service transition and continual service improvement. Like the full ITIL Service Operation (SO) eLearning course, you can access this free trial module from any device whether you are at home, at work, or on the move!